There are several ways to obtain certificates that have the compliant language. 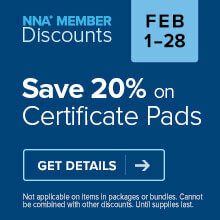 If you are an NNA member, the updated certificates are available immediately at no cost as a member benefit. Just log in to your NNA profile and download the PDFs. If you are not an NNA member, you may purchase Notary certificates with the 2015-compliant language. The California Secretary of State’s office will have a PDF of acknowledgements and jurats available for download at no charge. However, the forms are not yet online, and are expected to be available on January 1. I just passed my notary license exam, when I ordered my exam I paid for the signature book, ink, certificates and bond. I have not yet started notarizing because I am waiting for my background, oath ect. My question is, since their is new language in the certificates for 2015 dose that mean I will not be able to use the certificates I have now? was it money just waisted? Hello Alejandra, As of January 1, 2015, California Notaries will be required by law to use the new certificate wording. NNA members may download the new certificates through their member profile. Also, the Secretary of State's office is expected to make a PDF of the new certificate forms available on their site in January. I think you meant "compliant" not complaint, in the last paragraph. Thanks! We've made the correction. I too purchased the certificates. Can I order a stamp and just stamp the certificate? Hi Jeannette, Sorry, we don't offer a stamp for adding the new CA mandatory wording to existing certificates. However, if you're an NNA member, you can download the new CA certificate wording at https://www.nationalnotary.org/my-nna/member-benefits/downloadable-notary-certificate-forms. The CA Secretary of State's office is also expected to make the new wording available on their website in January. Is this change just for Acknowledgements that are attached to a document? What about documents that already have a printed section for the norary process? Hello Kathie. The change in California applies to all certificates of acknowledgment, jurat and proof of execution, whether preprinted on a document or as a loose certificate. Does the new 2015 consumer disclosure affect the form of oath we administer with a jurat, as far as compelling truthfulness? No, the procedure for administering oaths, affirmations and jurats in California remains unchanged.